The Estonian Ott Tänak (Toyota Gazoo Racing) dominantly wins the 36th ADAC Rallye Deutschland, the ninth round of the 2018 FIA World Rally Championship. It’s the second in a row victory for Tanak, after his triumph three weeks ago at Rally Finland, the third win of the season and the fifth WRC victory in a career. The driver of the #8 Toyota Yaris WRC was a dominant man over all four days of German WRC round, taking the lead on Thursday’s Super Special Stage in St. Wendel, then losing a lead in just one Special Stage on Friday morning but returning to the top on SS3 and then building a gap over the next three day. On Sunday afternoon, after 18 special stages, Tanak took the victory with the 39.2-second gap over championship leader Thierry Neuville in the #5 Hyundai i20 Coupe WRC. 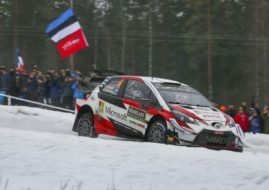 Another Toyota driver Esapekka Lappi finished in the third place, one minute behind Tanak. Sebastien Ogier recovered from a puncture on Saturday’s SS13 and two-minute loss which put him from P2 to P9, finishing the rally in the fourth place and taking additional five points with the fastest time on the Power Stage. Teemu Suninen (Ford Fiesta WRC), Andreas Mikkelsen (Hyundai i20 Coupe WRC), Craig Breen (Citroen C3 WRC) and Marijan Griebel (Citroen DS3 WRC) earned some championship points with positions from P5 to P8. Two best WRC2 category drivers Jan Kopecky and Kalle Rovanpera (both Škoda Fabia R5) rounded the top 10 in the overall standings. 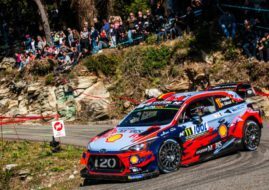 The biggest drama of the rally occurred on SS16 Grafschaft on Sunday morning when Dani Sordo and Jari-Matti Latvala dropped out from P2 and P3. Sordo had an accident and reached the finish line but he was forced to retire due to damage on his Hyundai. On the other side, Latvala’s Toyota stopped with a broken transmission. In the championship standings, Thierry Neuville remained on the top with 172 points. Sebastien Ogier is second with 149 points. Following two consecutive victories, Ott Tanak now has 136 points and he’s still a serious contender for the championship title with four more rallies to go. The next WRC round is the Marmaris Rally of Turkey on September 13-16.